PhotoTherapy techniques use personal snapshots and family photos to connect with feelings, thoughts, and memories during therapy and counselling sessions, in ways that words alone cannot do. "PhotoTherapy Techniques: Exploring the Secrets of Personal Snapshots and Family Albums" is the most comprehensive introduction to the field of PhotoTherapy available -- and it is an excellent substitute for taking an introductory training workshop! 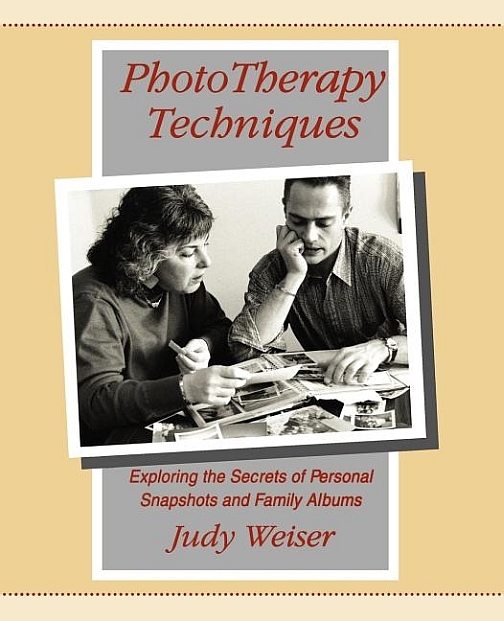 Written by psychologist, art therapist, consultant, instructor, trainer, and PhotoTherapy pioneer Judy Weiser, this book, now in its second edition, explains and demonstrates each of the major techniques involved, and provides theoretical rationale from both psychology and art therapy contexts. It also includes many photo-illustrated client examples, case transcripts, and practical experiential "starter" exercises so that readers can immediately begin using these techniques in their own practice. PhotoTherapy Techniques has been reviewed in many professional mental health journals and numerous public-media articles, generated a lot of positive feedback from readers, and is used as a text for university courses as well as being selected as the text for "Continuing Education" licensing credit courses for numerous mental health professions (through distance education programs). Originally published by Jossey-Bass in 1993; second edition by PhotoTherapy Centre Press in 1999. Now available: PhotoTherapy Techniques in Counselling and Therapy DVD (NTSC format) and PhotoTherapy Techniques in Counseling and Therapy, DVD (PAL format). Founder and Director of the PhotoTherapy Centre in Vancouver, Canada, and former Editor of the Journal Phototherapy, Judy Weiser is a licensed psychologist and registered art therapist interested in the nonverbal and visual aspects of communication and behavior (including cultural and gender differences). Listed in the Canadian Register of Health Service Providers in Psychology, Judy has focused her thirty-plus years of counseling practice on using PhotoTherapy techniques to help her clients heal -- and currently consults, lectures, and has given over two hundred workshops and presentations world-wide, teaching people about using these techniques to improve their therapy practice. Read more about this book and about PhotoTherapy techniques on the " PhotoTherapy in Counseling and Therapy " website.